I arrived at this art form through a metamorphosis that took even me by surprise. After checking out a book from my local library on concrete, I started to mix the normal concrete formula of a 1-2-3 mix. After a dozen or so pourings, I realized I wanted more from this amazing material. I thought that it would be so much more fun to be able to sculpt with the concrete. My first attempt was a fish that I could give to my son, who at the time was a starving student, and still he managed to keep a salt water tank viable. The fish I sculpted was so ugly; even he refused to take it off my hands. I knew I had to learn a lot more about concrete. I read anything I could find. I asked a lot of questions of my local concrete companies. And then I discovered an amazing gentleman, to whom I owe my passion and knowledge of concrete. Mr. Donald Tucker has been a wonderful mentor to many people including myself. I have been very fortunate to spend some great time with him in his studio, and as a teaching assistant with his Faux Bois classes in Tennessee. My years growing up with my artist mother in Southern California had a great visual impact on me as well, that I was not aware of until recently. I grew up going to Missions and hanging out with her artist friends. There was some older Mexican Faux Bois, El Trabajo Rustic, resonating with me that would be expressed some time in my future. 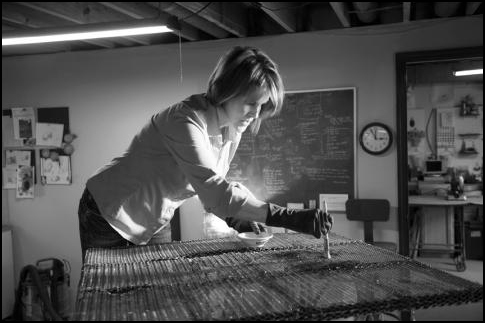 I proudly weld the steel armature, wrap and secure the steel lath to each piece, and then sculpt with multiple concrete mixes, on every piece that comes out of my studio. Each piece has a blue bird of happiness, representing my pure joy in sculpting the ferrocement faux bois. I have spent my adult life as a Metalsmith, with an MFA degree from Washington University in St. Louis Missouri. But the metamorphosis happened … and I now absolutely love concrete. My truth: Transcending the ubiquitous creative process. Discovering férrocement faux bois, false wood, activated my search for truth about Art. It stirred a yearning for working long days, with concrete dust as my permanent hair spray; not being able to sleep, with visions of sculptural wood-like concrete floating ephemerally through my mind’s eye. “Capturing Nature” is not only the title to a book about Dionicio Rodriguez, the father of faux bois; it is my life’s work . . . with rebar, steel lath, and concrete.